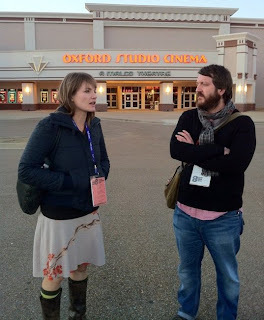 Oxford Film Festival Take 5 With...: Take 5 with ... "Emergency Contact"
Take 5 with ... "Emergency Contact"
As we gear up for the 10th anniversary Oxford Film Festival, we wanted to introduce you to the filmmakers and their films you will experience on Feb. 21-24, 2013. For Valentine's Day, we thought we'd connect you with a film for lovebirds. Meet Jeffrey Ruggles, director/writer/producer of "Emergency Contact"
EMERGENCY CONTACT a snapshot of a particular moment in any serious relationship. The discussion of who to put as your "emergency contact". Lots of lessons are learned on every film. For this it was importance of patience and rehearsal. Best part, is always working with such great and talented friends. I would say that I've been making movies seriously for about the past 4 years. Before they were student projects or just little lo-fi things. I would consider what I'm doing now to be working in film. Disney will somehow find a way to cut EMERGENCY CONTACT into the next Avengers movie. That will be the only type of distribution I will be happy with. Hopefully more festivals (but none will beat Oxford) and a feature in the summer!